There was some discussion last week on the Fayette County Historical Society’s excellent Facebook page about Uniontown’s centennial celebration. I knew we had relevant artifacts here in the PA Room, so I thought I’d look into the history of the event. First, to clear something up: While lots were drawn for Beeson’s Town in 1776, our borough was not formally established until 1796. Hence, the 1896 Centennial. We weren’t 20 years late for our own party. Phew. 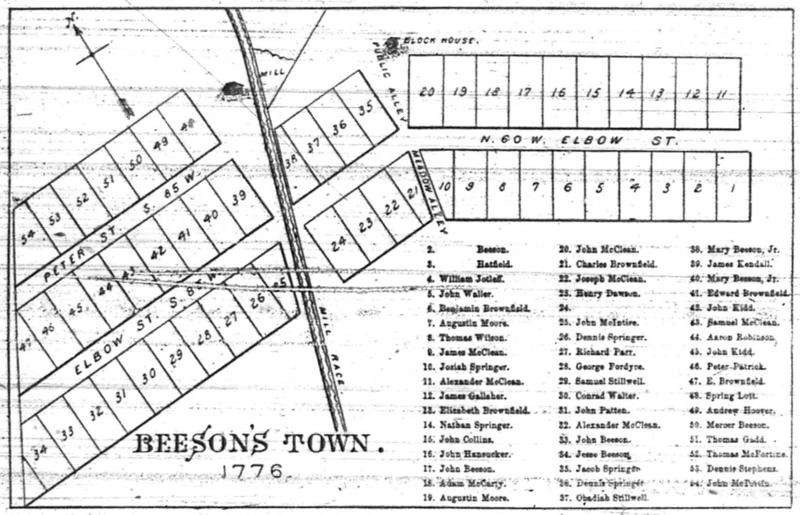 Map of the original Beeson’s Town lots, printed in the July 4, 1896 edition of the Daily News Standard. 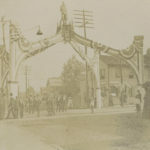 According to the Daily News Standard, almost every building in Uniontown was decorated for the celebration. 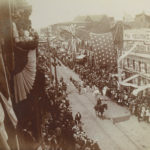 “Streamers, banners, bunting and flags are numerously displayed everywhere,” the newspaper reported the day before the festivities started. Many merchants were forced to order more decorations on short notice to meet the demand. Even the jail was strung with a big “WELCOME” sign — which prompted some jokes to be made at the sheriff’s expense. 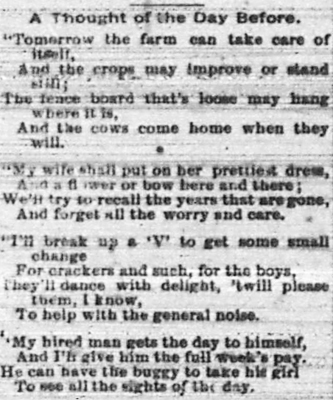 Part of a poem published in the Standard on July 2, 1896. As the Centennial Committee held their last meeting and preparations wrapped up, visitors poured into local hotels. One group from Scottdale send a lodging request for a party of 105. People from the outlying townships also came around to gauge whether the festivities were worth attending. One Wharton Township man heard of Uniontown’s “big blowout” and chose to investigate. 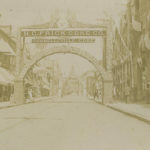 He looked up and down Main Street, astonished by the sights and sounds of a city that was suddenly “buried in bunting.” Local companies had built huge arches across the roadways, some lit with electric lights. Meanwhile, near the courthouse, the W.J. Rainey Company had placed a three-ton chunk of coal on display. One of the first events was the unveiling of a new water fountain at the intersection of South, Church, and Morgantown Streets. Donated by the Women’s Christian Temperance Union and the Y.M.C.A., it was inscribed, Come brim your cups with nectar true / That never will make slaves of you. “Mabel at the Fountain” was 14 feet tall and 3500 pounds. It would be displaced by a road project in 1919, moved to Confluence, and later melted down for scrap during WWII. All that remains now is one of the horse heads, which is on display here in the Pennsylvania Room. 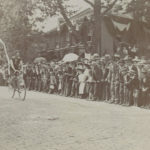 The rest of the first day promised several addresses by local leaders, music from the popular Rutter Band, fireworks, and a bicycle road race from Beeson Avenue and Fayette Street out to Searights and back. 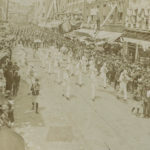 Another race would be held the following day, along with a mock battle between a few military companies and a grand parade. I couldn’t hope to describe the proceedings as well as the Standard and Genius of Liberty, both of which dedicated whole editions to the Centennial. (These papers also had great articles on Uniontown’s history pre-1896: descriptions of former businesses, an explanation of how the borough was formed, reminisces by local centenarians, etc.) I encourage you to come down to the PA Room if you’d like to read them! There is one very special artifact from our collection that I’d like to share, however. The real beauty of this collection was that its contents were loaned by individuals from all over the county. The list shows what historical objects our ancestors were holding onto, what they were proud of, and what they found worthy to share with their community. 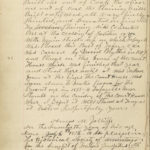 A page from Jolliffe’s Centennial journal, showing curios on display at the event. The next page listed the name of the person who loaned each item. There was over 30,000 people in Uniontown on the 3rd – 4th of July. The weather was beautiful. Everything passed off quietly. All enjoyed themselves and went home satisfied. No one hurt and very few drunk. 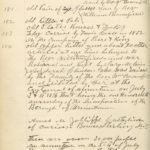 All the secret orders of the county and some from other counties were here. All Grand Army Posts of the county and several Posts from a distance were here. 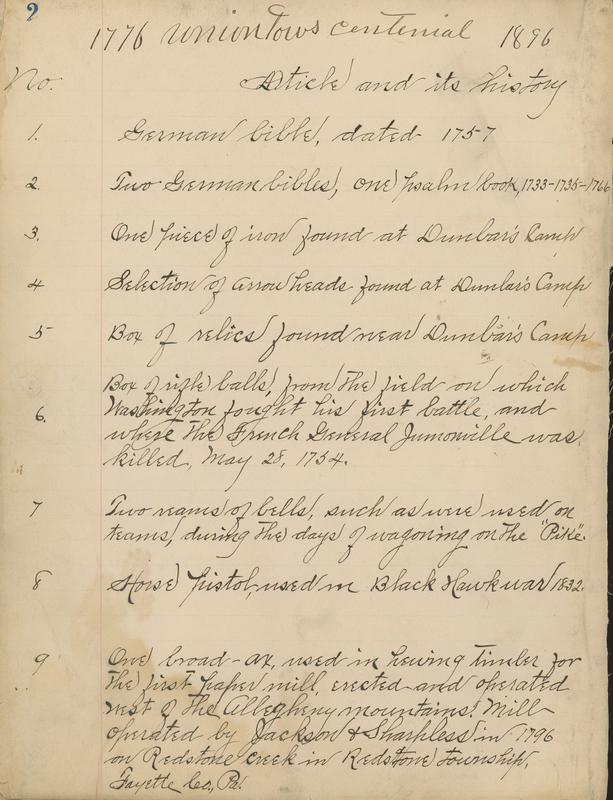 Five military companies, the Sheridan Saher Co. of Pittsburgh, Battery B of Pittsburgh with three guns and 40 men, and large delegations from the different townships came in wagons and horseback. 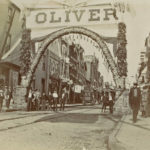 The different coke companies Oliver, H.C. Frick, Atlas, Dunbar, Redstone, and different others were in line with large delegations with wagons exhibiting their different products such as coke, coal and (?). 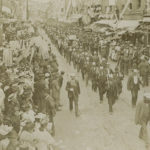 Large delegations of men were in line, some on horseback and others on foot with their safety lamps and picks and shovels. In fact everything that the men used in their work carried on hauled in line of procession. The fireworks at night was splendid. They were put off on top of Beeson’s hill overlooking the town on the South Side. There were five arches across the streets all lit up with electric lights which made a splendid show at night. The H.C. Frick Coke Co. built one out of coke. The Oliver one out of coal. The plaining mills built out of wood, all very finely painted, and decorated in fine style. The (?) Plaining Mill Co. erected one at the crossing of Gallatin Avenue with Main Street upon which Lafayette was placed. This bust of Lafayette was carved by David Blythe in 1847 and placed on the dome of the courthouse which was finished that year. 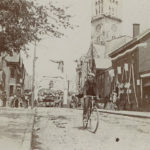 [It] stood there until it was taken down at the time the courthouse was taken down to make room for the present one in 1893-1894. Lafayette now stands in the corridor of the courthouse where I expect it will stand as long as it lasts. 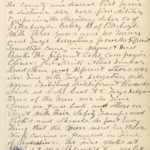 In the seventieth year of his age, [this writing] done July 6th 1896, to be placed in the Historical Society of Uniontown, PA for the benefit of future generations that they may know how we celebrated our first centennial. We don’t expect to be here to help celebrate the next one but would like to have it done right. 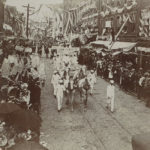 For more information on the 1896 Centennial, check out the newspapers from the event or James Hadden’s History of Uniontown. Some aspects of the celebration, such as the dedication of Mabel at the Fountain, were written about by Buzz Storey and collected in his Stories of Uniontown. Thank you to PA Room volunteer Paul Davis for his help digging up relevant articles!